Good Turnout for the annual Prescott Bluebird Recovery Project Spring workshop! On a typical late winter day—a little rain, plenty of clouds, and a little sunshine, returning and new volunteers gathered at Champoeg State Park Feb. 24 for our 2018 Spring Workshop. Our returning monitors and banders picked up their packets of materials for the coming nesting season. New volunteers received their initial overview of what’s involved in monitoring a bluebird route. 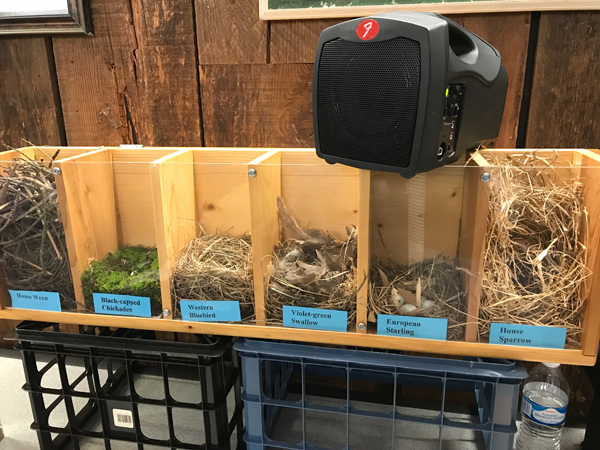 The photo shows our display of the different nests made by species that compete with bluebirds for nest boxes, as well as natural nest cavities. The PBRP Board was delighted to welcome so many new volunteers. With new members come fresh ideas and energy, and we’re excited for the 2018 bluebird nesting season! If you missed the workshop and want to get involved, let us know!